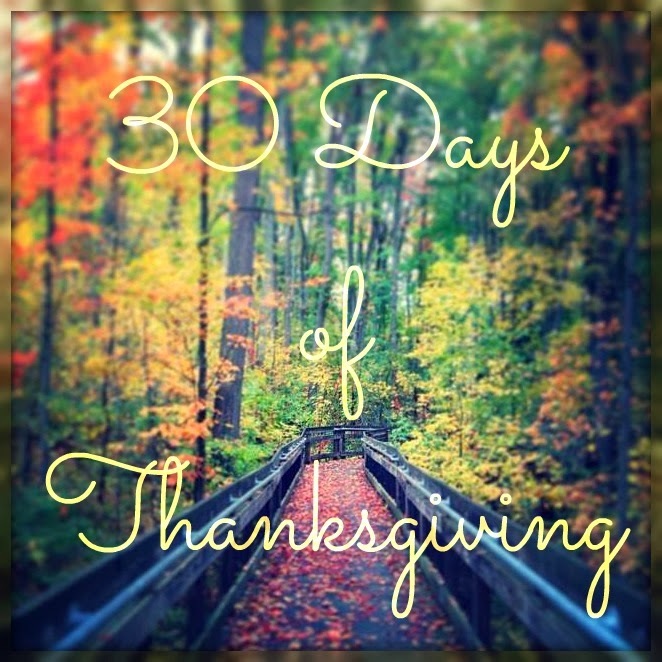 11.9.13 ~ Today I am thankful for the kindness of strangers. Random acts of kindness, simple acts of decency...whatever you want to call them, they restore my faith in humanity. Being on the giving end, the receiving end, or just witnessing an act is always an inspiration to me. 11.9.13 PRIZE: China Glaze has another beautiful holiday collection this year and it's called Happy HoliGlaze. I'll be sharing reviews and swatches of the shades in some upcoming posts. 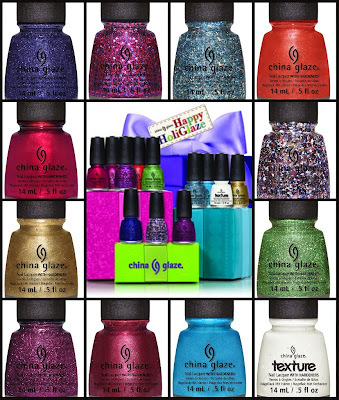 China Glaze has generously offered an amazing prize for not just one winner, but five winners! 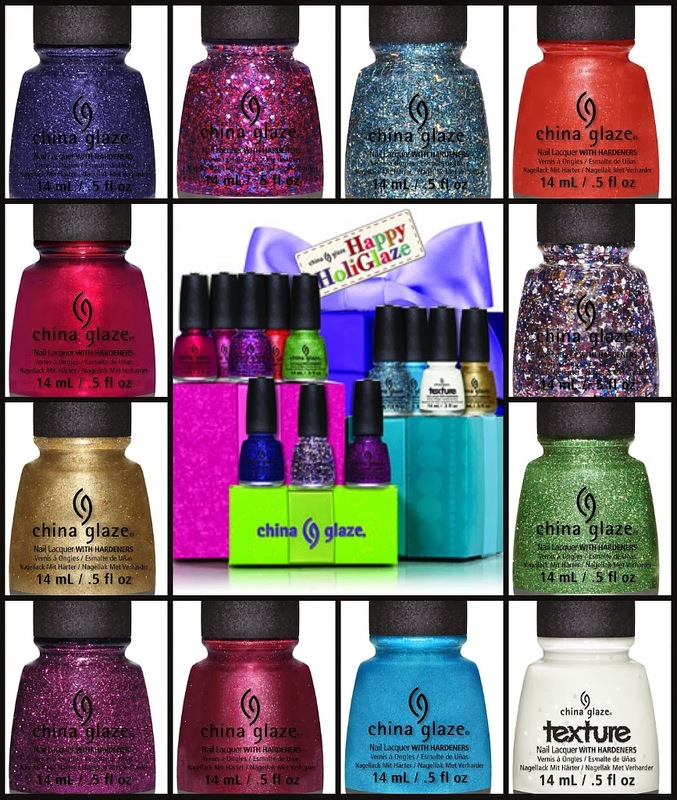 Five followers will each receive 1-complete set of the China Glaze Happy HoliGlaze Collection. Please read the rules below for entry and exclusions. Today I am thankful for burgers with cheddar, onion rings, and ranch dressing on them. :-) Sometimes it's the little things that matter the most. I'm thankful that my friend had a happy, healthy baby today! Today Im thankful my daughters broke down car is finally fixed. I am thankful that I live in New England, where there is a Dunkin' Donuts on almost every corner. I am thankful for my sweet kitty! Today I'm thankful for amazing customer service reps. I am thankful for the delicious mexican dish I had today. It brought alot of good memories. I'm thankful for all these amazing giveaways! I'm thankful that I can spend this Sunday with my family and friends! Today I'm thankful for my sister and would love to win this for her because she's obsessed with nail polish! I am thankful for weekends where I can decompress and TRY to get some stuff done around the house. I am thankful that my baby went from taking no naps to taking LONG naps! Praise the Lord! I'm thankful for my husband who ran out to a restaurant last night to get me my favorite hot chocolate. I am thankful for the parents I have had. They were perfect for me, maybe not for everybody, but they were mine and my brother's and for that I am grateful. I'm thankful to have a wonderful man in my life! Love him! I'm thankful to have a loving man in my life! I'm thankful for having a mom that can sew. I am thankful for the friends and family who have blessed me with their time and patience these past several days. I am thankful for my mom, it's her birthday today! I am thankful for my family and good health. I'm thankful that my children arrived home safely! I'm thankful for having a home. It's not big or fancy, but some people don't even have a place to lay their head! Today I'm thankful for my amazing parents! I love spending every minute possible with them! I'm grateful my friends could make it out to lunch and book-shopping today! Of course I am ALWAYS Thankful for family etc....but at the moment, I'm also feeling Thankful to China Glaze for offering up so many of these gorgeous sets for giveaway this holiday season & to the many blogs (including this one) hosting the giveaways lol. I am thankful for my dog who can turn the worst day around with a wag of his tail! I'm thankful for my children - they're healthy and becoming wonderful people! That my dad survived Vietnam & had me. I am thankful that my husband has a steady job. my niece! love her to pieces! I got to sleep in! I'm thankful for our Veterans, today and every day! Today I am thankful for my grandparents, and very thankful that, at 30 years old, I still have all four of them! Today I'm thankful for a warm cozy home! Today I am thankful for great music! I am thankful for the nice weather. today, i am thankful for all our military service men and woman, past & present, who serve in honor! I am thankful for a good warm summer this year. I know winter will be brutal but it wil go by fast (at least I hope!). I am thankful for good health! I am thankful for my health! Today I'm thankful for the first snowfall of the winter season. Thank you for the giveaway! I am thankful for my freedom! Some of my family members are starting new jobs this month and I'm thankful for the wonderful new career opportunities they'll have in their new positions.